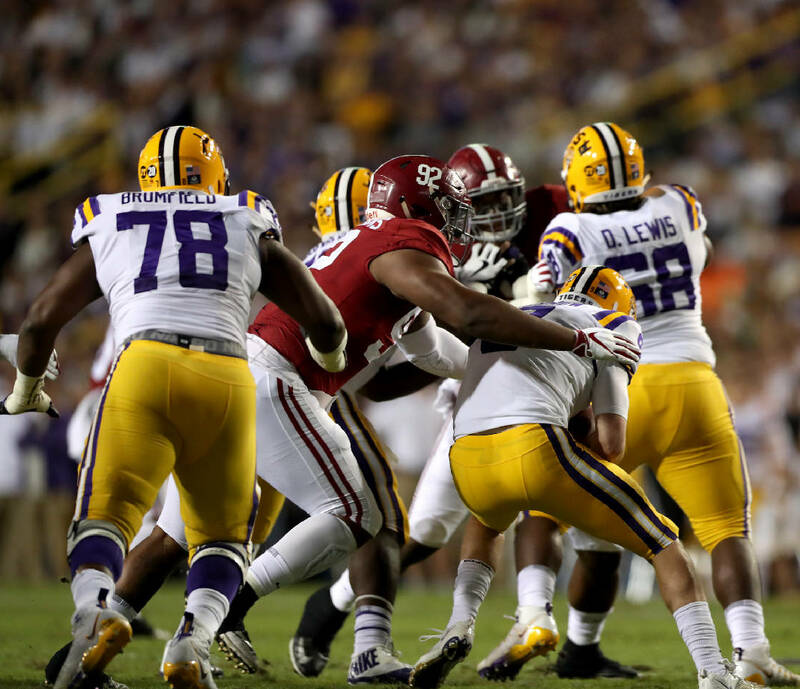 Alabama defensive lineman Quinnen Williams (92) had 10 tackles, 3.5 tackles for loss and 2.5 sacks during the Crimson Tide's 29-0 trampling of LSU on Saturday night in Baton Rouge, La. Alabama. What else can we say? Seriously. The Tide went to LSU and completely whipped the Tigers. Yes, Tua threw an interception, but the Alabama defense pitched a shutout, and the 29-0 win over soon-to-be-lower-than-No. 3-ranked LSU was, like most all of Alabama's wins, not as close as the final score. In case you're interested, the only team Vegas believes to be within double-digits of the top-ranked Tide is Clemson, which the sharps rank as an 8.5-point underdog vs. Alabama. Georgia. That was a very Alabama-like statement in Kentucky. Georgia went to work, punched the clock and punched UK in the facemask. (Sorry, Chas. I thought it was going to be much closer, too.) Side question for you UGA backers out there: I'm not the only one who thought this was going to be the D'Andre Swift we were going to see all season, am I? That dude was a DUDE last year — and let's be really clear, college RBs wearing 7 are money — and we expected him to be a monster — like he was Saturday — from August on. Calhoun high school football. That's right there are a slew of choices for winning and losing the weekend from our Friday night heroes, but let's pause for a moment and look at Calhoun. Hal Lamb's program has welcomed all comers who wanted a shot at the Yellow Jackets' region supremacy. Friday night it was LFO, which boasts its best team in at least a decade, that was calling. The final: Calhoun 49, LFO 0. That's 18 consecutive region title for the Yellow Jackets — yes 18 — and that's a new GHSA record. And the only thing more impressive than that kind of dominance is perfection. Calhoun has not won 120 consecutive region games — a steak that dates back to Oct. 19, 2001. For perspective, the last Calhoun region loss happened before the XBox was released. Egad. Notre Dame. The Irish passed arguably their biggest remaining hurdle on the road against a feisty Northwestern team. Plus, Michigan continuing to punish Big Ten foes makes Notre Dame's season opening win over the Wolverines look better and better. New Orleans. Some time in the not too distant future, when we look back at the 2018 NFL season and remember it as the year the NFC playoffs went through the Big Easy, Drew Brees getting serious consideration as SI Sportsman of the Year — dude is re-writing the most important chapter in the NFL record book and is well on his way to his first MVP — and everything else, we are going to see that Week 1: Tampa Bay 48, New Orleans 40, and say, "What?" We could say the NFC South in general, considering the Panthers and the Falcons also own four-game winning streaks after impressive showings Sunday. But these Saints, man, pick your poison trying to stop that offense. Vegas sportsbooks. Sunday was one of the bloodiest on record, according to this story from ESPN gambling expert David Purdum. There were monster landslide public teams — 88 percent of the action was on the Chiefs -8 over Cleveland (KC won 37-21), and 87 percent of the public money was on Minnesota and Pittsburgh — and all three won and covered. Estimates got to has high as $10 million lost on Sunday alone, and considering the public's desire to play big favorites and popular teams in college football — Alabama, Clemson, Georgia, Michigan and Notre Dame all covered relatively easily — I know several local entertainment hunters who also did well in the college game. The ACC. Yes, Clemson is aces and Dabo Swinney got his kid a TD, which, as he said, made momma happy, which, we all know, fits the bill for winning the weekend. There have been four 60-point wins in the history of the ACC and two of them have been notched by Clemson in the last six weeks. That said, the rest of the ACC is dreadful and buckets has any coach or program fallen as much as quickly as Bobby Petrino and Louisville? Oh my. Mike McCarthy. Hey, the Pats are great. The class of the NFL for going on two decades. But this guys has been the head coach with the Packers since 2006 and for the most part has wasted the amazing talents of Aaron Rodgers. McCarthy is 124-74-2 in the regular season and 10-8 in the playoffs. So he's 50 games over .500 in his career, and Rodgers as a starter in the regular season is 45 games over .500 (97-52-1). Yep, ol' Mike is right there with Jeff Fisher on the milk carton of mediocrity at 27-22-1 without Rodgers. Lakers drama. Man, good thing they are in Hollywood, right? There's enough background noise around this thing that here's betting LeBron has a Saban-esque blowup before Christmas. (And it may even be before Thanksgiving.) The Lake-Show was down 42-17 against Toronto after a quarter Sunday night. Yes, you read that right. Dude doing the closed caption on every Ed Orgeron news conference. Excellent Tweet here from showing snapshots of Coach O's news conference quotes. The shots have Big Ed from the Swamp saying, "Doing everything he can Proteion in Libya," "Old thing. Got to be Taliban allows crime L L barrel," "Yeah Yeah no missiles on Latonya guy is that they will" and "Money. Orchestral talk about retiring Earth." We can all agree that Coach is right about one thing — it's got to be the Taliban. Stupid Taliban. 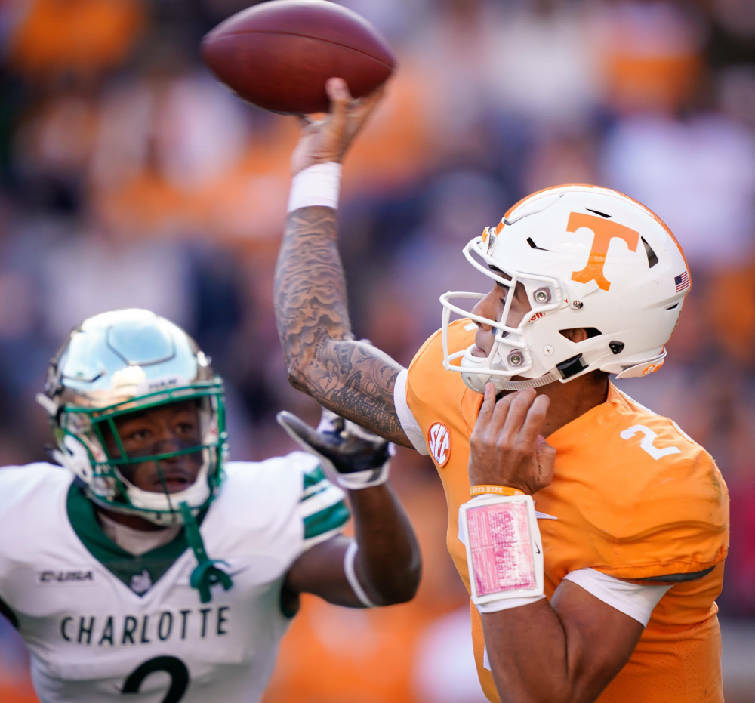 Tennessee's Jarrett Guarantano releases the ball before Charlotte defensive back Ed Rolle can get to him in the first quarter of Saturday's game in Knoxville. OK, we now have three college football games left. Sigh. We are 75-percent through the slate, and if we take a step back and look at what has happened in Knoxville, we have a fair amount of evidence to play a little game we like to call the Good, the Bad and the Ugly. We will play this after the Vols games for the next three weeks. The Bad. The Tennessee offense. Yes, no one is looking a win horse in the mouth at this point for Tennessee. All wins are wins and never the 'twain shall meet. But man, 14-3 against Charlotte, and the Vols offense managed all of 192 total yards and 20 rushing yards. If not for Marquez Callaway's 82-yard punt return for a score, this one was going to get incredibly hairy. Just for comparison, six weeks ago, UMass put 49 on the board against Charlotte. The Ugly. UT's bowl chances are slim. Needing two wins in the next three SEC, the results from Saturday in regard to UT's future foes could not have been much worse for the Vols. UK is up next for UT and the Wildcats got smashed and will likely be pretty ticked off come Saturday. Missouri got well Saturday against Florida and Drew Lock looked like Drew Lock. Vandy was off and got to rest. — Speaking of struggling offenses, the UTC Mocshad their playoff dreams all but dashed with a 16-10 loss at Furman on Saturday. UTC managed just 264 yards of offense and did not find the end zone until the final two minutes of the game. — The Fab 4 (times 2) picks went 5-3 last weekend. Here's the link, Larry. (The mid-week picks — we need a name for those people — went 4-0 for those who were paying attention.) Let's just say that riding a heater and expecting — and getting — big entertainment from Alabama Saturday night made for a very entertaining weekend. We hit Texas A&M +4.5, which was the rare dream scenario, over 61 in Clemson-Louisville, USC pick em over Ole Miss, under 58 in Missouri-Florida and Alabama -14. We missed (badly) on THE Ohio State -17 (we can agree there are issues there, right?) and La. Tech +24 at Mississippi State. We also got back-doored in Army -7 over Air Force, but the a 5-3 mark, a huge end of the night and Auburn winning the game and not covering was supremely entertaining all the way around. We are now 39-26-1, which is 60 percent on the dot. — If this story is true, that the Jacksonville Jags turned down a Teddy Bridgewater-for-Dante Fowler deal before the season and declined calls from Cleveland (for Tyrod Taylor) and Philadelphia (for Nick Foles), then someone in the front office has some 'splainin' to do. That's not only fireable, there could be legal charges of malpractice there. — Not sure if you saw the hubbub about James Carville's appearance on College Football GameDay, but here's the recap from the renowned liberal political strategist. Carville offered that thew SEC is in cahoots to help Alabama — as if Alabama needs it — and it forced ESPN to apologize to the league and to SEC commissioner Greg Sankey. Truth be told the mistake was made by the booker, because Carville — a huge LSU fan — has been outspoken about his conspiracy theory long before he set foot on the set with Corso, Herbie and the gang. — Programming note: We will have some college hoops stuff in Tuesday's 5-at-10. Deal? Deal. — We didn't have a spot for it, but nice win for the Falcons on Sunday. Kudos. — Also, kudos to Chattanooga for not embarrassing ourself with Trump in town. Weekend winners and losers, and we'd be happy to hear your suggestions. As for today, Nov. 5, on election eve, let's review. Did you know that today is the day that Dr. Emmet Brown hit his head and thought of the Flux Capacitor which allowed the "Back to the Future" stuff to happen. Bill Walton is 66 today. Bryan Adams is 59. Monopoly was launched on this day in 1935. Rushmore of board games. Discuss.